"The only report I've ever seen that accurately shows the many layers of the Public Television system." "We've received tons of praise from indie producers for this report!" "We needed this. Thank You! We had no idea there were so many places we could go after hitting a brick wall at PBS. Now our project has a distributor for national broadcast!" A Dendrite Forest Book, 110 pages. 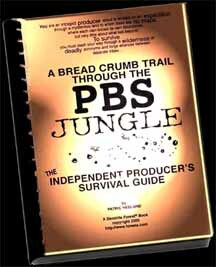 What kinds of deals does PBS make? Who do I talk with? How do I approach them? Do I have to give my program away? What if the subject is controversial? Are there really hundreds of ways to get my show broadcast if PBS turns me down? Until now, there has been no map readily available to Independent Producers who want to see their production aired on national public television. This book answers important questions every filmmaker encounters, including how to find funding and how to structure deals for public television. Read this book to understand the big picture. Use it repeatedly as a reference. Align your production strategy with the way the system really works.